Here are three entree-worthy warm salads from QVC’s resident foodie and cookbook author David Venable. t Sure, salads are nutritious, but making a salad is also an easy way to take everything you like, throw it into a bowl with some dressing and call it a meal! We tend to steer clear of salads during the cold-weather months, but there’s no need to do that — you can make a delicious bowl of greens that fulfills your winter cravings for warm and hearty food. t Here are three entree-worthy warm salads that are filled with tasty ingredients to keep you full and satiated during the chilly season. Heat the olive oil over medium-high heat in a large skillet. Add the onion and fennel and cook for 5 minutes, stirring occasionally. Add the cooked butternut squash, salt and pepper. Saute, stirring occasionally, for another 6 minutes. Remove the mixture from the heat and place it in a medium-size mixing bowl. Add half of the dressing, toss and set aside. Place all ingredients into a small blender or food processor and process until fully combined. Strain the mixture through a fine mesh colander. Store the dressing in the refrigerator until it’s needed. tDavid’s insider tip: Hosting a party? Here’s a fun serving idea: Instead of making one giant salad, fill Mason jars with salad for each guest. Layer as directed for effect and then write your guests’ names on the lids. Place the jars on each plate and you’ve got a perfect place setting! To prepare the dressing, add all the ingredients to a food processor and process them until smooth. To toast the tortillas, pour the oil into a 10-inch skillet and set the heat to medium. Heat for 5 minutes, add 1 tortilla and fry for about 30 seconds or until crispy. Flip and fry the other side until crispy. Remove the tortilla from the oil and drain it on a paper towel. Prepare the remaining tortillas as directed, and when they’re cool, roughly chop them. To assemble the salad, put half of the romaine lettuce in a clear glass salad bowl and layer the ingredients in this order: tomatoes, red onions, the remaining romaine, corn, olives, chicken, red peppers, chopped tortillas, queso fresco and scallions. Serve with the dressing. tDavid’s insider tip: When frying bacon, be sure to keep a close eye on it and turn it often. Bacon can burn in the blink of an eye, and older bacon will cook and burn almost twice as quickly as fresh bacon. Wrap leftover bacon tightly to keep it as fresh as possible! Toss the spinach, red onion, mushrooms and cranberries together in a large bowl. Set them aside. Whisk together the bacon drippings, vinegar, sugar, mustard and basil in a saucepan over low heat. Season with a pinch each of salt and pepper. Drizzle the warm dressing over the salad and toss to combine. Add the crumbled bacon and eggs. Top with the Pecorino shavings before serving. To assemble the salad, place the arugula in a large mixing bowl. Add half of the dressing and toss. Add the warm vegetables and toss again. 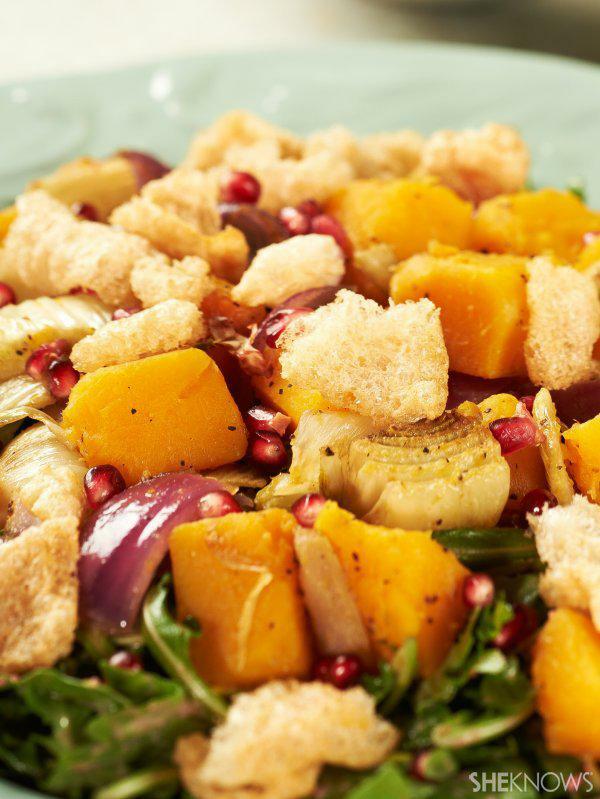 Sprinkle the pomegranate seeds and pork cracklings over the salad and serve immediately.